Bhubaneswar: Jindal Steel & Power Ltd (JSPL) has successfully completed a 250 Ton Basic Oxygen Furnace (BOF) marking the completion of its 6 MTPA integrated steel project at Angul, Odisha. With the completion of the new steel making facility, JSPL will utilize the full capacity of its 4 MTPA Mega Blast Furnace, the largest in India. The BOF will also enable the Company to achieve significantly higher cost effectiveness and efficiencies for steel making. “With the successful completion of the BOF today, the Angul Steel Complex will now achieve optimal efficiencies in terms of cost and operation. We congratulate JSPL’s Angul Team for completing the BOF within the prescribed time frame,” Mr. Naveen Jindal, Chairman – JSPL said. Mr. Jindal has been camping at Angul and working shoulder to shoulder with the project management team for commissioning of this facility. 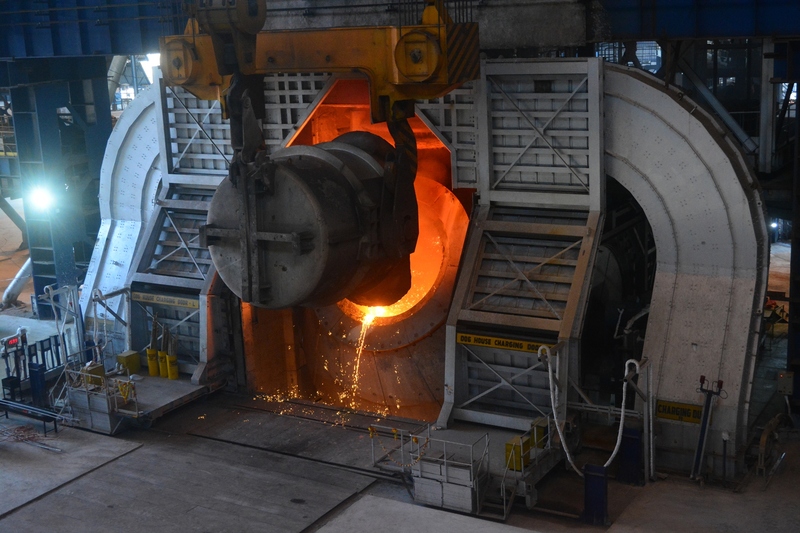 The 250 Ton Basic Oxygen Furnace will produce 3 Million tonnes of high-grade steel per annum. For the first time in India, JSPL has deployed the innovative Dry Gas Cleaning System, which is superior in terms of environment-friendliness as compared to the Wet Gas Cleaning Plant. “Adoption of Dry Gas Cleaning System reiterates JSPL’s commitment to Green Technology,” Mr. D.K. Saraogi, JSPL’s Executive Director and Angul Plant Head said. Significantly lowering the energy consumption and parallelly generating converter gas that can power other units of the steel complex, the new steel making facility is amongst the most energy efficient installations world over. The Dry Gas Cleaning System, with nil effluent generation capabilities, and full utilization of slag for various purposes further strengthens the zero discharge features of the plant. JSPL has partnered with SMS Group for engineering and supply of key BOF equipment. JSPL had commissioned India’s largest Blast Furnace of 4554 cubic meter (4 MTPA) in the month of August 2017. JSPL’s Angul steel making complex is the largest and most modern integrated steel plant in the state of Odisha that has been established at an investment of Rs. 33,000 crore. The BOF is the last major installation at the 6 MTPA integrated steel plant, marking the completion of JSPL’s expansion and capital expenditure program.